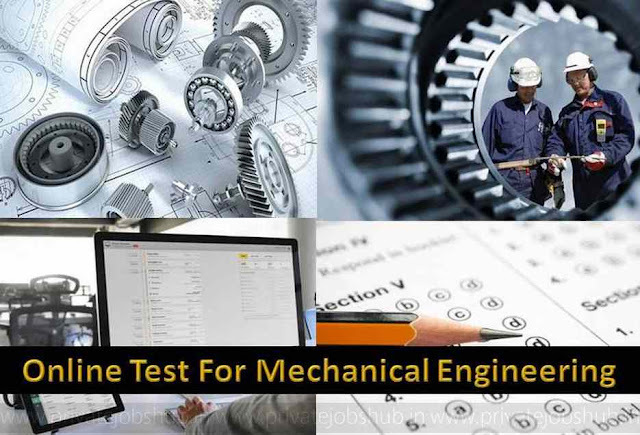 Online Test For Mechanical Engineering: We presents the Online Test For Mechanical Engineering exams. These tests provide benefit and helps in scoring good marks to the candidates who are going to appear for Mechanical Engineering examination. These questions are selected from the previous year exam question papers and from other Mechanical Engineering papers. Detailed solution will be provided which is developed by experts. So attempt online quiz For Mechanical Engineering now to improve you score. One question will be provided to you at a time, select the answer from the given options. Save the answer to continue to the next question. You can also skip the question for a later time. At the end of the examination, you will be provided with the answer sheet and review. You can compare your answer with the correct ones. Question 1 The range of projectile on a downward inclined plane is __________ the range on upward inclined plane for the same velocity of projection and angle of projection. Question 2 According to principle of conservation of energy, the total momentum of a system of masses in any direction remains constant unless acted upon by an external force in that direction. Question 4 Which of the following do not have identical dimensions? Question 5 A smooth cylinders lying on its convex surface remains in __________ equilibrium. Question 10 The coefficient of restitution for elastic bodies is one. Question 14 The term 'force' may be defined as an agent which produces or tends to produce, destroys or tends to destroy motion. B. To replace them by a single force through C.G. Question 20 The angle between two forces when the resultant is maximum and minimum respectively are..
We hope that these questions will help you in your exams. For any query or doubts you are free to contact us through www.privatejobshub.in and we are here to help you 24*7 or you can comment or write us below our represntive will contact you as soon as possible.